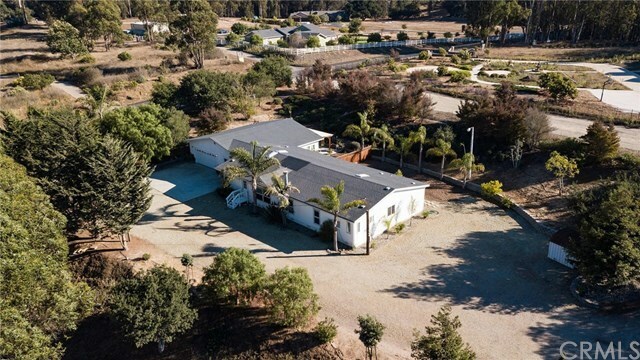 ARROYO GRANDE COUNTRY LIVING, CLOSE TO TOWN! Back on the market, no fault of Sellers. Main home + attached workshop area (w/full bathroom, closet and laundry) on 4.85 acres. Sits upon a gentle knoll to take advantage of the open rural views. Room for your projects, horses and pets. Fully fenced, 2 road accesses. Large 2500 sq. ft. manufactured home (2001) on its own foundation + stick built 840 sq.ft. addition (permitted) with its own private entrance, patio + laundry! Ideal space for the extended family, rental income or a home office. Open floor plan design: family room, living room w/ fireplace, a dining room + bonus room. White kitchen with storage, large pantry, pass through to great room. Convenient laundry room w/ storage and utility sink. Large private master suite- roomy bathroom, walk-in closet, soaking tub, stall shower. The 3 additional bedrooms and a full bathroom make this a comfortable family home. The stick built addition (workshop area) begins at the large enclosed breezeway with a tile floor. This flexible space provides a separation from the main house. Large room with walk-in closet and laundry hook-ups + a full bathroom and even a private fenced patio. Viejo Road at top of property gives easy access to pasture area. Workshop area with 20âx 30â concrete slab is fenced and gated. Has a private well and septic tank, both with recent reports. Additional septic connection in place and may possibly be used to add another living structure.